Dr. Angel Ruiz-Cotorro graduated in Medicine and Surgery from the University of Santander and went on to specialise in Sports Medicine at the University of Barcelona and the Pierre et Marie Curie University (Paris). A renowned sports physician, Dr Ruiz-Cotorro has been responsible for the physical well being of world class atheletes such as Rafa Nadal and Spanish Olympic teams for many years. In the past, he has been the physician of the Catalan Cycling Federation and since 1992 he has been collaborating with the Spanish Tennis Federation as the Medical Director. He has been with the Spanish Tennis Teams in Atlanta 1996, Sidney 2000, Atenas 2004 and Pekin 2008. He is the Director of the first medical center dedicated to tennis and related conditions, presently at Clínica Mapfre de Medicina del Tenis. 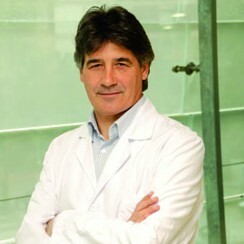 He operates at Centro Médico Teknon and he also directs a masters course in orthopedic surgery. If you would like to arrange a consultation with Dr. Angel Ruiz-Cotorro please contact us at info@medabcn.com or fill in the form to make your enquiry.